Has your homeschooler been writing MLA-style research papers for years and needs a new challenge? Is he or she planning to study psychology or a science field? It is time to try an APA-style research paper! This 7Sisters research paper curriculum for homeschool high schoolers, written with a conversational tone by Vicki Tillman, makes the APA paper manageable and fun. Many homeschoolers will find that when they start college, their science and social science courses require writing in APA-style. It is a VERY different format from the fun and familiar MLA-style research paper. It can be overwhelming! -There is no thesis statement! 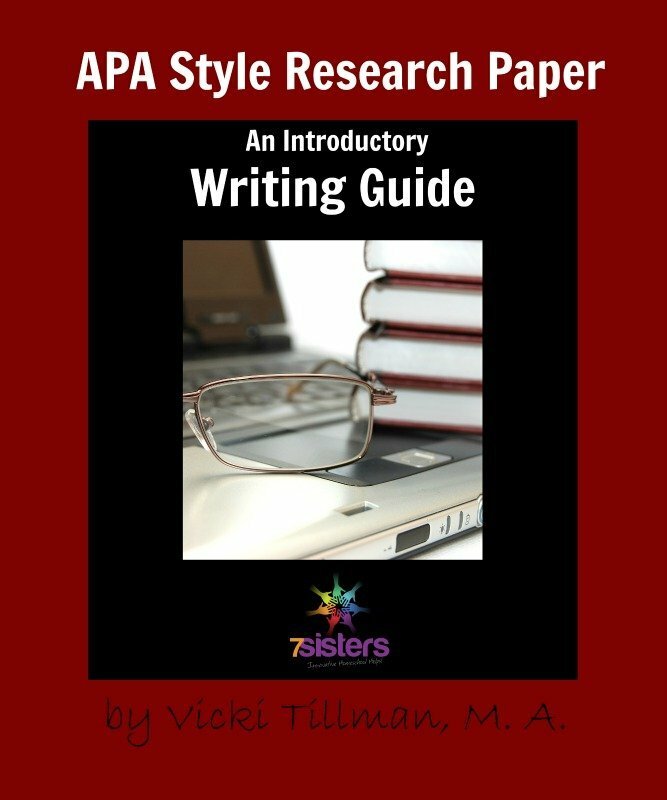 7 Sisters Introductory Guide to APA Research Paper Writing, a downloadable .pdf text, can help by guiding your homeschooler through a step-by-step process of learning how to handle the format and think like an APA-writer! Practice examples are included so that your high schooler gains confidence when writing the paper. Click here to view an excerpt from APA Style Research Paper: An Introductory Writing Guide. with our own students and hundreds in our local homeschool high school community over the years, we have seen success with writers of every variety. From those who love to write, to those who cry, “I don’t know know what to write!” Vicki’s friendly, easy-to-follow steps of instruction and the manageable pieces into which she breaks the research writing process result in papers completed and students encouraged. What is the Difference Between an APA and MLA Style Research Paper?